I forgot to tell you about my good friend Shawn Ireland who has started a blog. 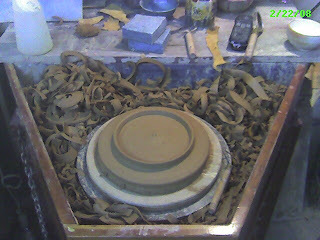 Look for his blog shawnirelandpottery.blogspot.com and keep up with the goings on at this Penland area potter's great pots and paintings. For the past few years Shawn has been going to Cortona, Italy for the winter working with the University of GA Studies Abroad Program and doing some of his own work as well. I've loved seeing the pottery he has made there and the drawings and paintings, too, not to mention the old Italian pottery that he collects. I mentioned Kyle's pots in yesteday's post and now you can keep up with his potter's life here. 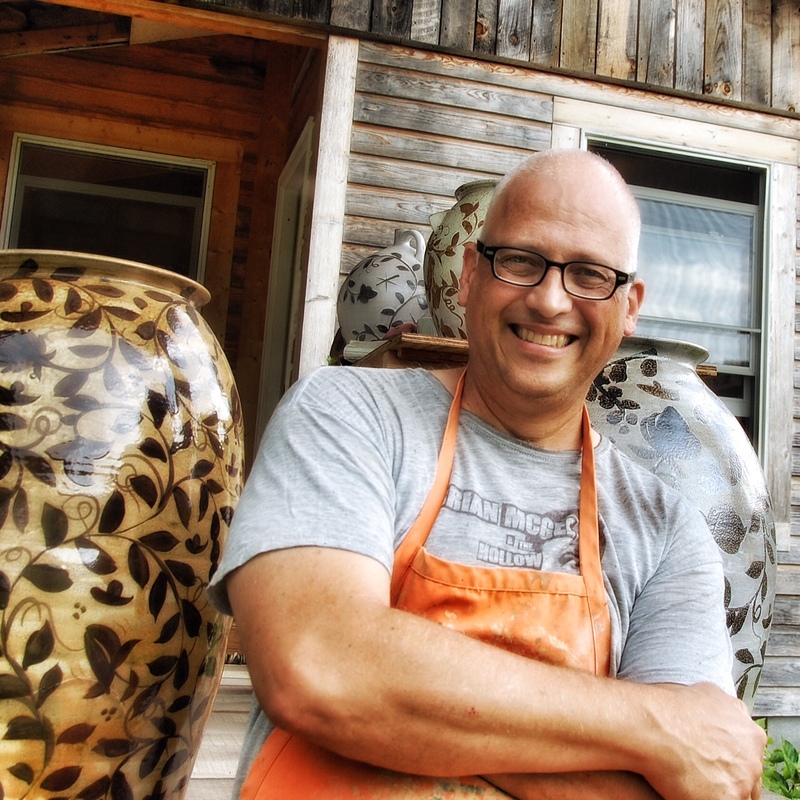 Kyle Carpenter is a potter in Asheville who has been doing some very fine work in soda/salt glaze. I hope you have time to look at some images he has posted here . Kyle and I will be in a show at American Folk Art and Framing in August. Well done Kyle! Before I ship them out I wanted to get a picture of these pots. So during a break in pottery making today, I arranged them and thought this combination was nice. We built the floor of the new workshop last weekend. Pat Houston, Shane Mickey, and Matt Anders helped get the floor joists, the girders, and plywood in place before the wind and rain(and snow) came yesterday. Matt had some huge tarps that gave a cover to the new floor. Mark Shapiro and I worked together in his pot shop for nine years (more history with Mark to come) and we had a lot of slang and jive that got sallied around and one of those sayings was "chasing plastic". Chasing plastic was what we did for the day or so after a big day of throwing to finish the pots before they got too dry for handles, trimming feet, etc. After making some pots last Friday I came down with whatever my daughters brought home from school last week and was pretty miserable until today. Well I finally made it back this evening to deal out feet to some plates. I guess I've been influenced by those "blokes" across the waters. I have this combing tool that I've made out of a shim and most often use it on flower pots. So I tried it out on some plates. The marks seem a little timid, not the same flair as Matt Grimmet gets from combing through white slip to red clay, but something worth pursuing. 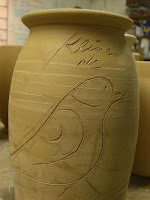 And after all those stoneware pots I've looked at this week in the Cushman book...well, I did thrown them last week. 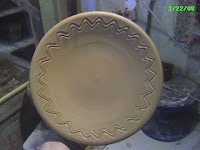 By the way, the combing happens on the wheel before the plate is cut off. Tomorrow more construction. Time for the floor. Which one of these do you like better? Your comments are welcome! Collection of Paul Cushman, Jr.
h. 14 3/4 in. diam (at waist) 10 5/8 in. h. 10 in. diameter (at waist) 7 1/4in. Exuberant best describes the uninhibited application of marks that crisscross this rotund jar. The marks assume a decorative function, segmenting the surface into horizontal bands and vertical halves. Most certainly the jar was intended as a presentation piece. The incised inscription"C Russell/ Pott/ Sunday" and the date 1809 offer some tantalizing clues to the vessel's history. Records show that Cushman purchased lots 9 and 10 on Lion St.(later Washington St) in Albany in 1805, yet the date 1809 is the earliest recorded on any Cushman stoneware. Does the date 1809 represent the beginning of production for Cushman, or at least the first firing? The Albany Directory of 1813 lists Caleb Russell, a mason living at 51 Deer St.( near State St). Could the "C Russell" incised on this jar be Caleb Russell who assisted Cushman with the building of his kiln? 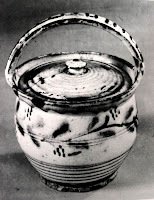 And could the jar have been a presentation piece to Russell to commemorate the first successful firing at the Cushman pottery, on a Sunday? Caleb Russell was also the fire inspector for Albany's 2nd ward, a large section of the city including the Public Square and the area west along Lion St. where Cushman had his pottery. This connection between Cushman and Caleb Russell seems more likely. Without a family history, however, the reason for the unusual marking may never be known for certain. ISBN 0-939072-15-7. or call the Albany Institute of History and Art: 518-463-4478. I may offer my extra copy up in a contest to be announced. Check back. 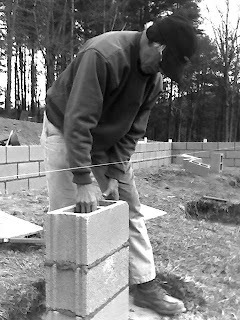 Tom Trout layed block while his son Gus made the mud to complete the foundation. It was windy, very windy. 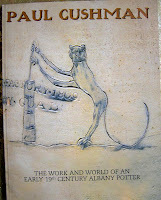 Thanks go to Michael McCarthy and Erika Sanger of the Albany Institute of History and Art for sending me copies of this book, Paul Cushman: The Life and Work of an Early 19th Century Albany Potter I have been looking through this catalog and marveling at some of the beautifully wacky imagery of the pots. This is a very scholarly work with essays by William Ketchum, W. Douglas McCombs, Paul Cushman Jr., Paul Huey, William Bouck,Warren F. Hartmann, and Christopher Mailman. 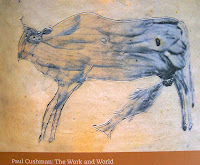 In its 144 pages there are many images of Cushman's output as well as related Albany New York area potters who preceded Cushman. Here are a few images I've taken from the book. Disclaimer: I took these with my camera and they may be a little blurry. My apologies. The catalog is beautifully presented and its original quality shouldn't be judged by these images. 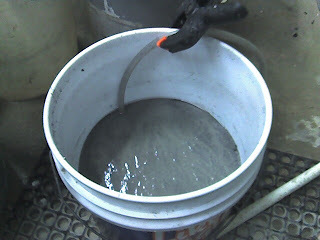 Here is a picture I meant to post after the "pour" on Tuesday morning. 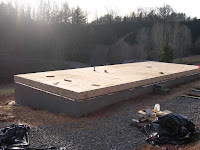 It took two trucks of concrete to pour the footings, 7 yards of concrete. If the weather cooperates we will set block this week sometime. But as it looks pretty sketchy, with typical February weather in in NC, we'll keep our fingers crossed. Yesterday I heard the frogs and peepers in the pond begin to croak because of the 50+*F weather. Yesterday, after posting that print of Mike's I realized that there is some sort of bird thing happening around here. Could it be that I'm a bird watcher? 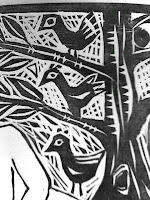 If you're a potter and bird watcher too, kind reader, do you use bird imagery? Please leave your comments. I love hearing from you and tell us where you're writing from. Here's a picture of our aracana hen, Silky. For those of you who are just now coming to this page, we are running a contest for a piece of my pottery for the first to guess the function of these pots. 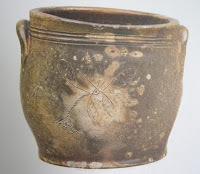 Here is another one of those mysterious pots from the North of Germany. Height : 33.5 cm., Width 37 cm. Take notice of the small openings on either side of the handles just as in the previous piece. Although we can't see it in the picture the "back" and the "bottom" are open per the authors description. If no one guesses by midnight E.S.T tonight(2/14/08) we will have to come up with another contest next week. Good Luck! Here are a few pots from North German Folk Pottery with captions by the author. 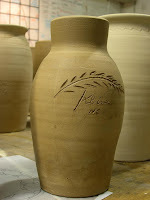 This first pot has a wonderful combination of brush marks and slip trailing. Click on any image for a larger view. Just exquisite. The heron is framed left and right by stylized little trees and leafed plants. Around the border runs a wavy tendril with leaves and fruit. 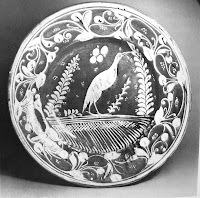 Two small holes above the heron served for hanging the dish and indicate its decorative function. The heron was at one time very common in North Germany, especially in the coastal lowlands. However, one must assume that a picture such as this was not painted from nature but was transposed onto ceramics by copying a graphic illustration. One of the most important collections of bird pictures, repeatedly copied over a period of 150-200 years, was the work of copperplate engravings by the Dutchman, Adriaen Collaert (ca. 1560-1618), entitled Avium Vivae Icones and published in two volumes in 1580 and 1598. 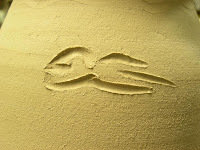 The native potter would almost certainly never have possessed such a work, but any copy would have enabled him to grasp correctly certain elements of the striding and the long dagger like beak, attributes which differentiate this bird from the crane or the stork, both native of North Germany at that time. Here are four interesting links to Adriaen Collaert's "Avium Vivae Icones"
This colander was probably used for washing and draining fresh vegetables and salad or, even more important, for draining cooked vegetables and potatoes. 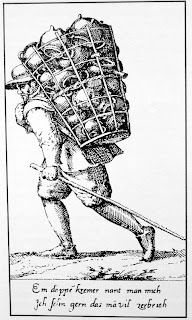 It could, if necessary, also be used for draining plain dumplings or semolina dumplings, which were served almost daily in one form or another; although for this purpose shallower colanders were usually used so that the dumplings would not be squashed together. or to carry food to sick people in the household or in the neighborhood. 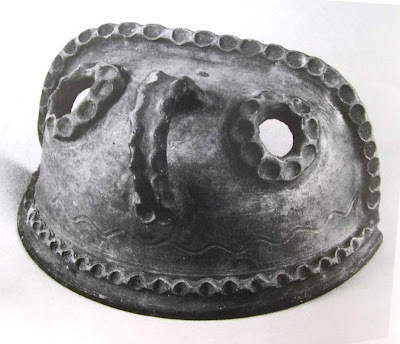 Such pots-usually more carefully decorated-could also be used for women in childbed. as barselspand or barselpotte (bucket or pot for women in childbed). I like to see lots of pots being broken." Yeah, who needs bubble wrap, anyway? 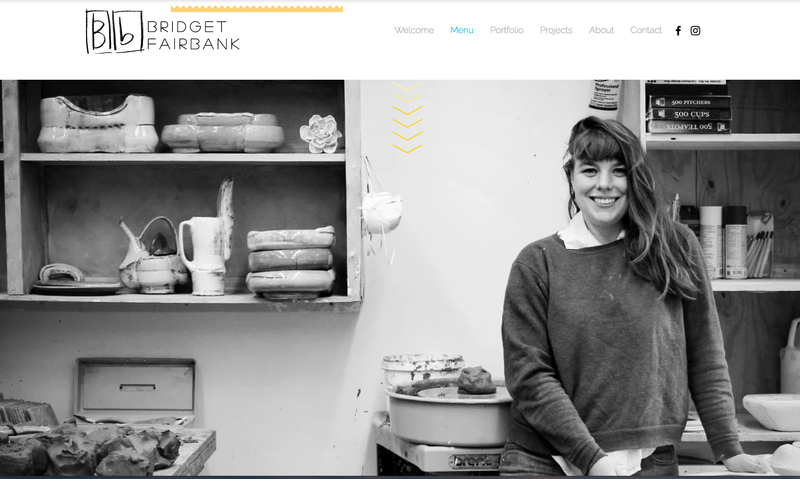 Support your local potter(s)! North German Folk Pottery of the 17th to 20th Century by Gerhard Kaufmann. Over 120 B&W and color photograph illustrations with detailed descriptive and background text. 148 page oversized trade paper cover fine. 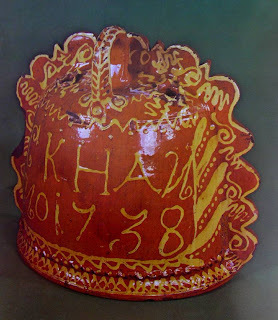 It is a catalogue of an exhibition of folk pottery from North Germany that toured American museums 1979-80. 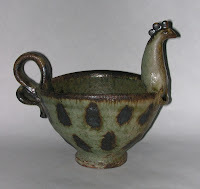 Early earthenware folk art, folklore and cultural history of northern Germany. You may be able to get a copy of this out of print book from David and Mary Farrell at Westmoore Pottery of Seagrove, NC. 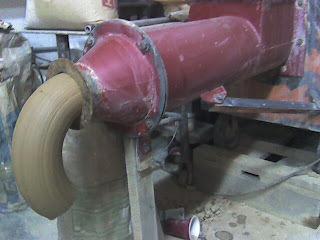 There are some very interesting forms and great examples of slip trailing. Can you guess what this is? Hint: it's not a face jug . Maybe I should give away a piece of pottery to the first person who guesses correctly. Hmmm??? I'll give the answer tomorrow. Here are few pots I made after dinner. 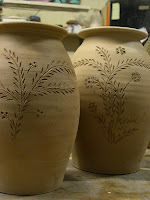 I have been "incising" some of the pots in the past couple of sessions with an engraving tool from my printmaking days usually when the pot was leather hard. 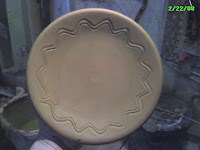 Here I've used a pin tool to make the marks fresh on the pot before it was cut off the wheel. It was fun and spontaneous and I'll see if I like them in the morning. 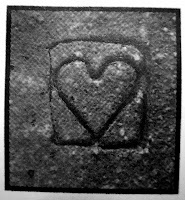 Taken from "Two Centuries of Potters", here is a picture of the stamp that Kim Ellington used on his pots that he fired at the Hart's Square ground hog kiln. Here is a little page that the Claremont School has put together about the kiln that Kim built at Hart Square in 1987. Happy Valentine's Day. I sat down tonight and flipped through one of my favorite books. 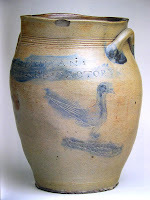 Maybe I have mentioned it before, Two Centuries of Potters, 1999, Lincoln Co. Historical Assoc. 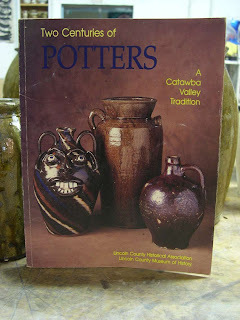 It's full of great information and pictures of the potters and pottery from the Catawba Valley of North Carolina. Since I don't have that many pots from this region in my collection, this book provides valuable information and catalogs many of the traditional shapes I have been exploring in my work. I thought I would mention it here and recommend it to those of you who make or collect pots. 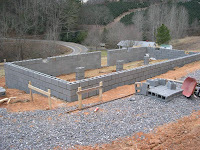 You can also call David Springs of Catawba River Trader, (704) 735-1155. He was one of the editors. David has a great store in Lincolnton, NC full of pottery. As a matter of fact I was shocked when I first went into his shop to see both windows on either side of the entrance full of old pots. Better than any museum, you could really look over the pots and get a feel of 'em. Better yet, buy 'em and take 'em home! David may still have a copies of the book for sale. Happy reading! 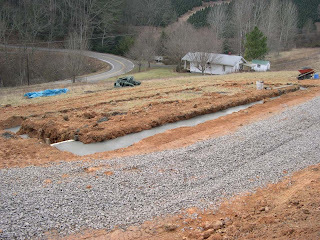 We poured a lot of concrete today and have the footers ready to receive the block foundation. Now I'm off to do some after dinner pottery. 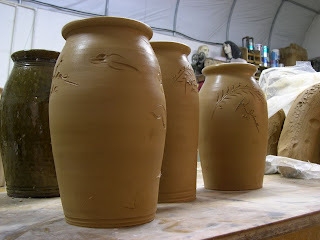 I guess I will be making pots at night and building workshop by day until the March firing. 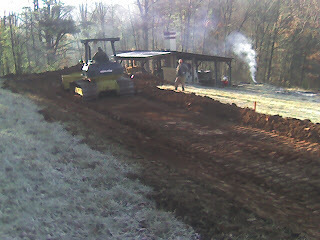 I'm really enjoying working at the new site and will be equally if not more excited to be making pots up on the hill. It's been a pleasure to see Stacey and the girls walking up the hill for a visit, the first of many visits to the pottery shop. Here's a picture of the pottery shop site with our house down below. I also wanted to thank Ron and Doug for their encouragement and all of you for reading. I've had S & D readers from all over the world because of their links to my site. It's a really exciting time here and I'm glad you all are along for the ride. The D4 at work on the new shop. 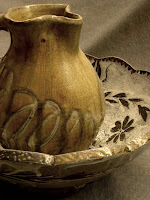 The Clay Arts Center in Port Chester, New York has posted the show "PotPOURri" which I am in. Check it out here and see the very nice show of pots that pour. Some of my Penland neighbors are in the show, Matt Kelleher, Nick Joerling, Suze Lindsay, Kent McLaughlin. Also some nice pieces by Phil Rogers, Lisa Orr, Ben Carter, Tara Wilson, Jeff Oestrich, Ursula Hargens, Marty Fielding, Posey Bocopolous, and Bede Clark. The show is beautifully presented online. There are some really nice pots. If I had to sum up today's work it would have to be process. This clay was pugged in my circa. 1974 Peter Pugger, pre stainless steel (possibly a prototype:per conversation with Randy the engineer). I bought it second, no, make that third hand from Nick Joerling who had gotten it from Jon Ellenbogen and Becky Plummer. 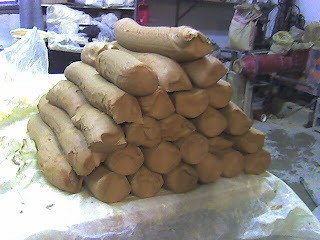 Anyway, the clay is ready for turning. Some of you may be saying, "It's about time, make some pots, already." Some might call it the business end, perhaps not the most "graceful" angle to view the old Peter Pugger, but I guess it will have to do. This thing can grind up the red dirt like no other. Occasionally I will find a little flake of steel that has gotten into the mix,but no alarm. Sometimes if the little bit of steel is hidden within the pot's wall it will melt out and leave a nice "comet" trail in the glaze. It could be worse I guess. 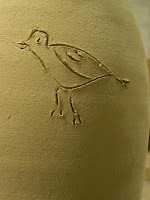 On a the rare occasion I will get a bit of plaster in a pot, which pops out after either the bisque or glaze firing. The auger is driven with what looks like a motorcycle chain. It's pretty amazing that it's still dependable and needs very little maintenance. I've had to weld the plunger recently after a crack developed. 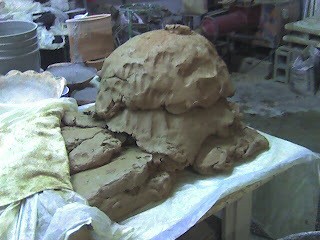 I probably pug about 5 tons of clay every year, since 1999. Not bad. What a great simple machine. Ready for the pugmill. 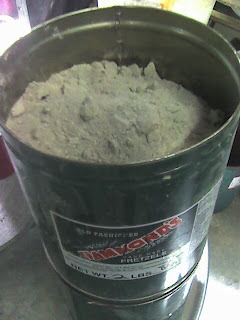 This is clay reclaimed from the December session. Siphoning off the "liquor" from the washing of the wood ashes. 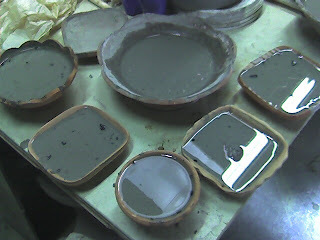 Bisqueware serves to draw any remaining ash "liquor" from the wood ashes. This liquor is caustic and can irritate your skin. Use rubber gloves and maybe safety glasses in case of a splash. 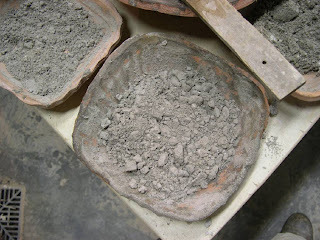 I use a ladle to scoop wood ashes into the pots. 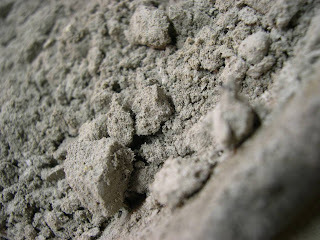 From fire comes ashes and that is what goes into my alkaline ash glaze: ash, common red clay, and feldspar. All local materials to the NC folk potter and to me as well. The process of getting this material is what Michael Cardew described as "donkey work", or work that is done after some time without self conscious thought. (Thanks to Doug Fitch for the link!) And thanks to Shawn Ireland for the Hammonds pretzels, which provide a perfect container for the ashes.